Hundreds of Christians gathered on a road-way leading the London ExCel centre to add their voices to groups and networks around the country who are highlighting the obscenity of the DSEI 2017 arms fair, due to open on 12 September. Their messages were clear: stop the arms fair – stop the arms trade. Silent Quaker worship, Taize music, drama, songs for peace and a Pax Christi service “The death of the arms trade” took place during a day which began early with members of the London Catholic Worker and others blocking the road, preventing lorries and trucks from entering ExCel. Henrietta Cullinan and Nora Ziegler from the LCW along with Chris Cole (Pax Christi Exec member) and Jo Frew were arrested and held all day. They, and others arrested on the day, have charged and called to appear in court on 19 September. Prayers were also offered by young Jewish and Muslim participants and Buddhists held a meditation session and chanted. The whole gathering shared in the Universal Prayer for Peace. Here you can see a video of Pax Christi’ Pat Gaffney reading words of Pope Francis and here a report of the day. Thanks to Independent Catholic News. MORE TO COME: Join us on Monday 11 September between 6.30 – 8.00 for a Silent Vigil held outside the ExCel centre, on the eve of the arms fair. 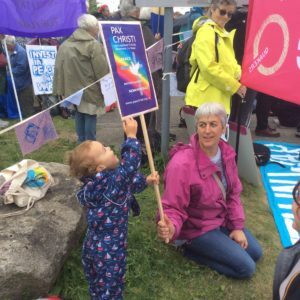 Among those taking part on 5 September were Pax Christi, Christian CND, Anglican Pacifists, Fellowship of Reconciliation, Midlands Peace Group, Westminster Justice and Peace, London Catholic Worker, Put Down the Sword and Quakers in Britain.